What are the benefits of Temping? Temp work doesn’t always get the best press. It may be that the workers are derided, or people see it only as unskilled, low paid work. This isn’t always the case. Temporary work also includes parental leave cover of up to 12 months, interim management positions, roles where employers (for whatever reason) can’t commit to a permanent contract. Of course, there are lower skilled, lower paid positions too. These can often be a great way to get back into the swing of work. Companies need temporary workers for a variety of reasons. They may have been hit by a flu epidemic, their work may be cyclical, they may have a project that needs covering. It doesn’t mean to say that it isn’t valuable work. In fact the complete opposite is true. Good temps are worth their weight in gold. They turn up at short notice, solve the staffing problem for that day, week, month and move on again. 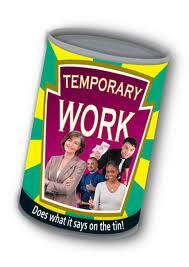 There are lots of benefits to temporary work too. You choose when you work – the choice is always yours. Many employers look to their temporary workers first when recruiting for permanent vacancies. It can often negate the hurdle of CVs & interviews, as the agency will often be able to send you straight in. Temporary workers are now protected by law too. Legislation is in place to make sure that after a period of time, if you are doing the same work as someone permanent, in the same job, at the same level, you should be paid the same. You accrue holiday pay from day 1. In some circumstances you accrue sick pay and parental leave rights. So, if you’re looking for something new or just want to get out of the house – give us a call and see what’s available.